240ml (8oz) size. Uses 121mm lid. 360ml (14oz) size. Uses 121mm lid. 500ml (16oz) size. Uses 121mm lid. 600ml size. Uses 143mm lid. 700ml (24oz) size. Uses 121mm lid. See links below for containers. 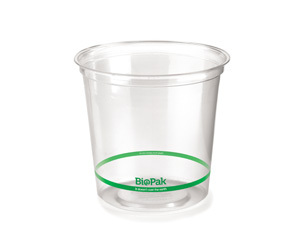 BioPak clear containers look and perform like any other, except they are made from Ingeo™ natural bioplastic. Ingeo is made from plants, not oil. Starch taken from plants is transformed into Ingeo™ biopolymer. Producing these bowls results in 75% less greenhouse gases than the conventional plastic it replaces. Together we are making sustainable choices for a better tomorrow. 143mm lid to fit 600ml & 700ml wide EcoBowls. - Suitable only for cold food only, they are perfectly clear and sturdy, performing excellently when serving cold meals. Lids to fit 24oz & 32oz salad bowls - see links below. 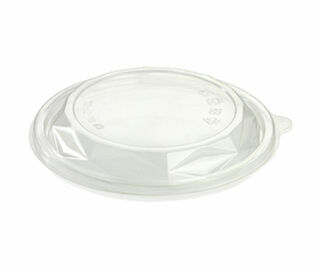 Cold Cup Flat Lid Clear to fit 60ml, 150ml, 200ml & 280ml. 24oz Clear Plastic Salad Bowl. Our bioplastic bowls are made from plants not oil and are commercially compostable. Note they are cold use only. 32oz Clear Plastic Salad Bowl. 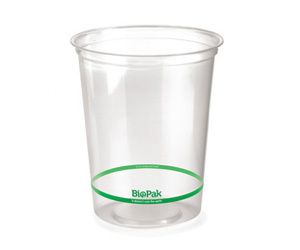 Our bioplastic sauce cup are made from plants not oil and are commercially compostable. Note this cup is for cold use only.